I was back at Summerhayes this week and for once the forecasters had got it right and it was chucking it down, a quick pit stop at the Little Thief set me up for the day and then it was on to Bridgwater. There was a good turnout today with some new faces which was great to see along with the more familiar ones and it was nice to see the Wickham’s again, unfortunately the Tart was back again and trying to make out I owed him a pound from last time as his weight percentage was closer to the winners than mine was! Have you ever heard such rubbish and the worse thing is, it took him a week to think that up! Todays match was a rover on all ponds and I was hoping I’d be able to get on Longs somewhere, the golden peg was drawn and it would be choice number 9. Pete announced the draw and everybody started delving into the bucket, I asked the Tart what he had and of course he was on the golden peg, I went for it and pulled out number 10 and the only good thing about it was that I could make sure I wasn’t too close to him! Roy Hughes had first choice and went for peg 13 on Sellicks, Nigel Wickham went for 18 on Longs, Scott S picked Sellicks 11, Matt on 23 Longs, Simon Ryall went back on Longs 15 where he won on Monday, Gareth Lennox chose his favourite peg, 23 on Sellicks, Bruce Hunt went for 15 on Perch Pit, Rob Birch went on 34 Longs, the Tart went back on 37 Longs (where he was on Monday) so I decided on peg 32 on Longs (next to where I was last time). It looked nice and I set up a 0.3 gram NG Mini Gimp for the top two lines left and right and also at top two plus one straight out, the other rig was a 14 x 11 MW F1 Slim for a ten metre line. On the side tray I had 2mm Bait-Tech Carp and Coarse Pellets which I’d soaked the night before and given a decent dusting of Special G Dark plus some 4mm Xpands for the hook. I also made up some paste but when I came to find the only two paste rigs I own, they were nowhere to be seen and I think after my one and only disastrous attempt at fishing paste, I must have thrown them in a cupboard somewhere, never to be seen again! I was ready with a few minutes to spare so popped up to use the loo and on the way back, I stopped off to clarify with the Tart how the side bet would be decided today as I didn’t want him trying to swindle me again! We both decided the fairest way would be on our respective positions in carp and silvers (remember that!). Pete blew for the start and I fed modest amounts of micros on all three of the short lines before starting to the left (just off the reeds). I had to wait a short while for my first bite (which of course I missed) and then missed the next one as well, I hit the third one which was a nice skimmer of 8oz, I then had a hand sized skimbob followed by a tench, another smaller skimmer and then a leaper of a pound or so and was really enjoying myself when the bites just stopped (much like the last match) although I was fairly happy with about 3lb of silvers in the net. I cupped in some more micros before switching to the right hand line, Rob appeared from behind his bush and asked how I was doing and said he was already getting carped out with four in five chucks. No indications from the right hand line so decided to have another quick go on the opposite side, the float settled before sailing away and after a short scrap, a lovely crucian about 10oz popped up, no bites for a bit but then had a proper skimmer of 2lb plus and not long after another of similar size and along with a few skimbobs I had 5lb in the second sixty minutes to put me on 8lb after two hours. So although slower than Monday it was steadier and I was getting quite a few indications. I had several more skimmers in the third hour along with a nice roach to add another 3lb to my total and despite the rain I was really enjoying myself and even better, no carp as yet! 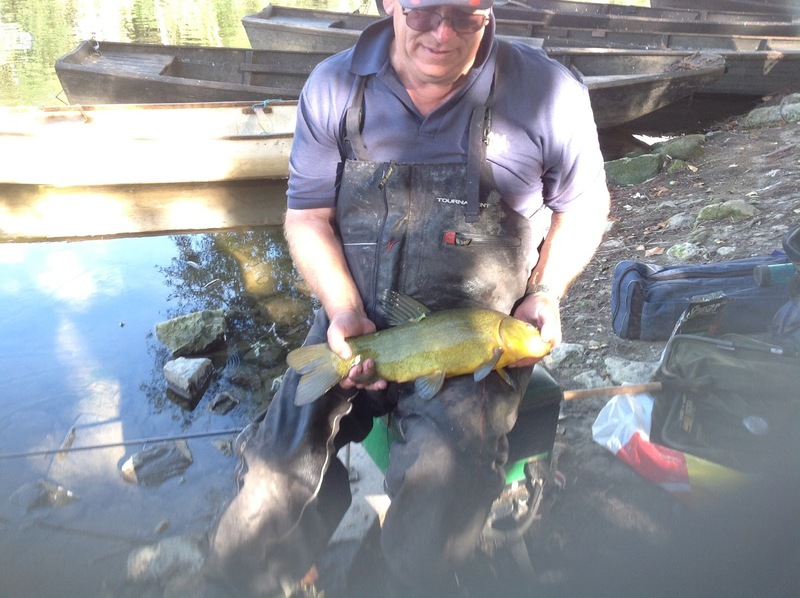 I did lose what felt like a crucian or tench and also had a fish which could have been a skimmer or lethargic carp come off. 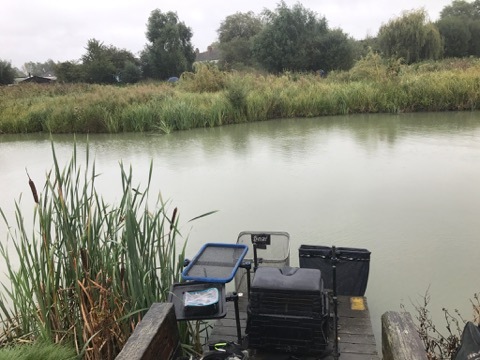 Then just when I thought I was on for a good weight, I couldn’t get a bite, I tried the right hand line but only had one missed bite so I cupped in some more micros on the two short lines before venturing out to the top two plus one line for the first time. Two carp in two chucks wasn’t the response I’d hoped for and was just about to give it up as a bad job when I had a 4oz skimbob, two more carp followed so put some more feed in before going to the loo. I stopped to ask Rob how he was doing and he said he was getting some decent skimmers but still having carp problems and had one while I was there. As I passed the Tart he was playing a carp and that smug look was back again so I didn’t ask how he was doing. Back on my box and things hadn’t improved, all I could catch from the left hand line was carp and I pulled out of several foulers too and I still couldn’t catch from the right hand line. 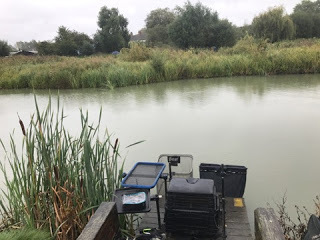 So after three steady hours where I’d put 11lb in the net, I’d stalled again (in hindsight once the bites on the short lines stopped, maybe I should have put some feed in on the longer line and fished that for an hour or so). I did try paste on the left hand line and had a couple of knocks but as I don’t know what I’m doing with it, I soon gave it up as a bad job. 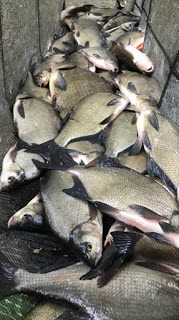 Going into the last hour I upped the feed and was putting in a full toss pot every chuck and started getting some smaller skimbobs and had another crucian and with five minutes to go I had another two pounder and was getting regular bites and didn’t want the match to end. When Pete signalled the all out I had 26 silvers and thought I might have a bit more than I had on Monday, maybe 13-14lb but was sure it wouldn’t be enough, especially when Rob said he’d had ten big skimmers. I packed up and took some of my kit back to the car, I met Jeff coming the other way, he’d been on Sellicks peg 15 and said he’d struggled for 7lb or so, the next person I saw was Glynn who said he’d caught all day and might have close to 20lb and with Pete only paying the top two in silvers, I knew my bad run was set to continue. 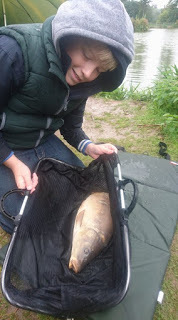 The scales started with the Tart who had done better than last time with 128lb 12oz, then Lewis Jones did really well on peg 40 to weigh 142lb 9oz as he’d only just got back into fishing. Glynn Wickham was next on peg 4 on ‘Suicide Straight’ and had a nice net of skimmers weighing 17lb and I thought I’d be short of that. There were a couple of DNW’s before we got to Simon Ryall on peg 15 where he had nearly 200lb on Monday but this time he weighed 77lb 12oz which just goes to show that fish swim! Dave Romain had done well again to go into the lead with 158lb from peg 26. 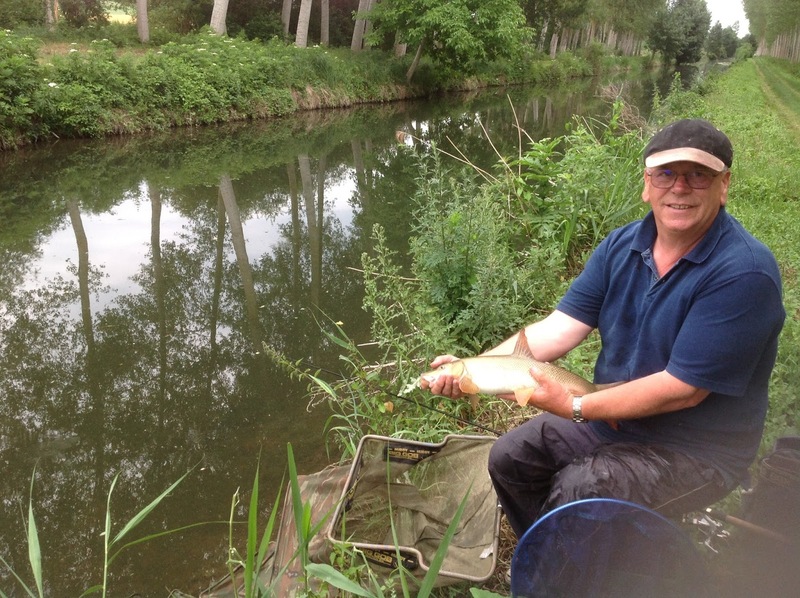 Then it was my turn and it was a lot closer than I thought with my weight being called at 16lb 4oz and those slow spells could prove to be costly. Rob had a brilliant 24lb 1oz to go into the silvers lead and as the scales headed to weigh in the other lakes, both the Tart and me were in third place so the side bet was still quits. 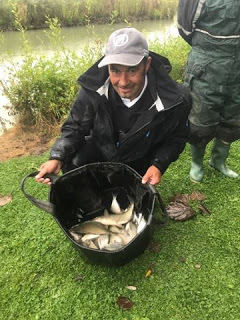 Bruce on Perch Pit weighed 19lb 8oz of skimmers, roach, perch and a big crucian to go into second in the silvers, onto Sellicks and Roy Hughes had 104lb 8oz of carp which just left Gareth Lennox who had 166lb 6oz of carp from peg 23 to win the match. 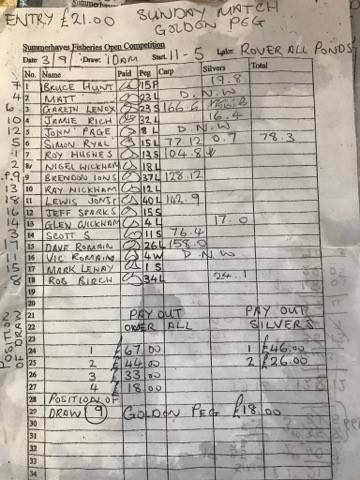 Back at the results and a quick look at the board revealed the Tart and me both finished fourth so the side bet was quits but then as he was last in the money he started saying I should pay up!!! No shame that boy, I might actually have to get the side bet rules written down, signed and counter signed before the next match to stop his desperate attempts to take a pound off me! On that subject, Jeff sloped off without paying up again. 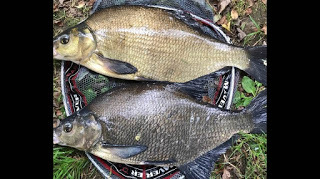 I have to say I’m really enjoying the silvers fishing here at the moment and the weights are really good although I’m still off the pace and need to find a way to keep those bites coming for six hours. Apologies for the lack of photos as it was absolutely chucking it down! A rather moist weigh sheet!